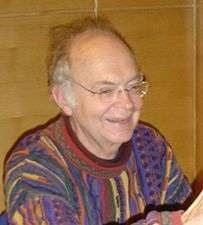 Donald Ervin Knuth (/kəˈnuːθ/ kə-NOOTH; born January 10, 1938) is an American computer scientist, mathematician, and professor emeritus at Stanford University. As a writer and scholar, Knuth created the WEB and CWEB computer programming systems designed to encourage and facilitate literate programming, and designed the MIX/MMIX instruction set architectures. Knuth strongly opposes granting software patents, having expressed his opinion to the United States Patent and Trademark Office and European Patent Organization. Knuth was born in Milwaukee, Wisconsin, to German-Americans Ervin Henry Knuth and Louise Marie Bohning. His father had two jobs: running a small printing company and teaching bookkeeping at Milwaukee Lutheran High School. Donald, a student at Milwaukee Lutheran High School, received academic accolades there, especially because of the ingenious ways that he thought of solving problems. For example, in eighth grade, he entered a contest to find the number of words that the letters in "Ziegler's Giant Bar" could be rearranged to create. Although the judges only had 2,500 words on their list, Donald found 4,500 words, winning the contest. As prizes, the school received a new television and enough candy bars for all of his schoolmates to eat. Knuth had a difficult time choosing physics over music as his major at Case Institute of Technology (now part of Case Western Reserve University). He also joined Beta Nu Chapter of the Theta Chi fraternity. While studying physics at the Case Institute of Technology, Knuth was introduced to the IBM 650, one of the early mainframes. After reading the computer's manual, Knuth decided to rewrite the assembly and compiler code for the machine used in his school, because he believed he could do it better. In 1958, Knuth created a program to help his school's basketball team win their games. He assigned "values" to players in order to gauge their probability of getting points, a novel approach that Newsweek and CBS Evening News later reported on. Knuth was one of the founding editors of the Engineering and Science Review, which won a national award as best technical magazine in 1959. He then switched from physics to mathematics, and in 1960 he received his bachelor of science degree, simultaneously being given a master of science degree by a special award of the faculty who considered his work exceptionally outstanding. In 1963, with mathematician Marshall Hall as his adviser, he earned a PhD in mathematics from the California Institute of Technology. After receiving his PhD, Knuth joined Caltech's faculty as an associate professor. He accepted a commission to write a book on computer programming language compilers. While working on this project, Knuth decided that he could not adequately treat the topic without first developing a fundamental theory of computer programming, which became The Art of Computer Programming. He originally planned to publish this as a single book. As Knuth developed his outline for the book, he concluded that he required six volumes, and then seven, to thoroughly cover the subject. He published the first volume in 1968. Just before publishing the first volume of The Art of Computer Programming, Knuth left Caltech to accept employment with the Institute for Defense Analyses' Communications Research Division, then situated on the Princeton University campus, which was performing mathematical research in cryptography to support the National Security Agency. Knuth then left this position to join the Stanford University faculty, where he is now professor emeritus. Knuth was a writer as well as a computer scientist. Knuth has been called the "father of the analysis of algorithms." In the 1970s, Knuth described computer science as "a totally new field with no real identity. And the standard of available publications was not that high. A lot of the papers coming out were quite simply wrong. [...] So one of my motivations was to put straight a story that had been very badly told." After producing the third volume of his series in 1976, he expressed such frustration with the nascent state of the then newly developed electronic publishing tools (especially those that provided input to phototypesetters) that he took time out to work on typesetting and created the TeX and METAFONT tools. By 2013, the first three volumes and part one of volume four of his series had been published. Concrete Mathematics: A Foundation for Computer Science 2nd ed., which originated with an expansion of the mathematical preliminaries section of Volume 1 of TAoCP, has also been published. Bill Gates has praised the difficulty of the subject matter in The Art of Computer Programming, stating that "If you think you're a really good programmer...You should definitely send me a résumé if you can read the whole thing." In 1995, Knuth wrote the foreword to the book A=B by Marko Petkovsek, Herbert Wilf and Doron Zeilberger. Knuth is also an occasional contributor of language puzzles to Word Ways: The Journal of Recreational Linguistics. Knuth has also delved into recreational mathematics. He contributed articles to the Journal of Recreational Mathematics beginning in the 1960s, and was acknowledged as a major contributor in Joseph Madachy's Mathematics on Vacation. In addition to his writings on computer science, Knuth, a Lutheran, is also the author of 3:16 Bible Texts Illuminated, in which he examines the Bible by a process of systematic sampling, namely an analysis of chapter 3, verse 16 of each book. Each verse is accompanied by a rendering in calligraphic art, contributed by a group of calligraphers under the leadership of Hermann Zapf. Subsequently he was invited to give a set of lectures on his 3:16 project, resulting in another book, Things a Computer Scientist Rarely Talks About, where he published the lectures "God and Computer Science". As a member of the academic and scientific community, Knuth is strongly opposed to the policy of granting software patents. He has expressed his disagreement directly to both the United States Patent and Trademark Office and European Patent Organization. Knuth gives informal lectures a few times a year at Stanford University, which he called Computer Musings. He is a visiting professor at the Oxford University Department of Computer Science in the United Kingdom and an Honorary Fellow of Magdalen College. Knuth's Chinese name is Gao Dena (simplified Chinese: 高德纳; traditional Chinese: 高德納; pinyin: Gāo dé nà). In 1977, he was given this name by Frances Yao, shortly before making a 3-week trip to China. In his 1980 volume of The Art of Computer Programming (simplified Chinese: 计算机程序设计艺术; traditional Chinese: 電腦程式設計藝術; pinyin: Jìsuànjī chéngxù shèjì yìshù), Knuth explains that he embraced his Chinese name because he wanted to be known by the growing numbers of computer programmers in China at the time. In 1989, his Chinese name was placed atop the Journal of Computer Science and Technology's header, which Knuth says "makes me feel close to all Chinese people although I cannot speak your language." 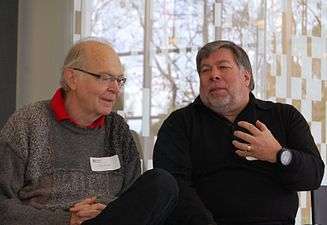 In 2006, Knuth was diagnosed with prostate cancer. He underwent surgery in December that year and started "a little bit of radiation therapy... as a precaution but the prognosis looks pretty good", as he reported in his video autobiography. Knuth used to pay a finder's fee of $2.56 for any typographical errors or mistakes discovered in his books, because "256 pennies is one hexadecimal dollar", and $0.32 for "valuable suggestions". According to an article in the Massachusetts Institute of Technology's Technology Review, these Knuth reward checks are "among computerdom's most prized trophies". Knuth had to stop sending real checks in 2008 due to bank fraud, and instead now gives each error finder a "certificate of deposit" from a publicly listed balance in his fictitious "Bank of San Serriffe". Knuth published his first "scientific" article in a school magazine in 1957 under the title "Potrzebie System of Weights and Measures." 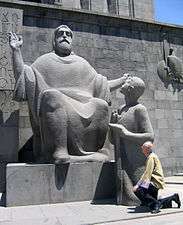 In it, he defined the fundamental unit of length as the thickness of Mad No. 26, and named the fundamental unit of force "whatmeworry." Mad published the article in issue No. 33 (June 1957). To demonstrate the concept of recursion, Knuth intentionally referred "Circular definition" and "Definition, circular" to each other in the index of The Art of Computer Programming, Volume 1. 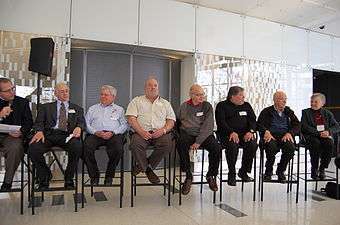 At the TUG 2010 Conference, Knuth announced an XML-based successor to TeX, titled "iTeX" (pronounced [iː˨˩˦tɛks˧˥], with a bell ringing), which would support features such as arbitrarily scaled irrational units, 3D printing, animation, and stereophonic sound. In 1971, Knuth was the recipient of the first ACM Grace Murray Hopper Award. He has received various other awards including the Turing Award, the National Medal of Science, the John von Neumann Medal, and the Kyoto Prize. Knuth was elected to the National Academy of Sciences in 1975. In 1992, he became an associate of the French Academy of Sciences. Also that year, he retired from regular research and teaching at Stanford University in order to finish The Art of Computer Programming. He was elected a Foreign Member of the Royal Society (ForMemRS) in 2003. ——— (1997). "The Art of Computer Programming". 1: Fundamental Algorithms (3rd ed.). Addison-Wesley Professional. ISBN 0-201-89683-4. ——— (1997). "The Art of Computer Programming". 2: Seminumerical Algorithms (3rd ed.). Addison-Wesley Professional. ISBN 0-201-89684-2. ——— (1998). "The Art of Computer Programming". 3: Sorting and Searching (2nd ed.). Addison-Wesley Professional. ISBN 0-201-89685-0. ——— (2011). "The Art of Computer Programming". 4A: Combinatorial Algorithms. Addison-Wesley Professional. ISBN 0-201-03804-8. ——— (2005). "MMIX—A RISC Computer for the New Millennium". 1, Fascicle 1. ISBN 0-201-85392-2. ——— (2008). "The Art of Computer Programming". 4, Fascicle 0: Introduction to Combinatorial Algorithms and Boolean Functions. ISBN 0-321-53496-4. ——— (2009). "The Art of Computer Programming". 4, Fascicle 1: Bitwise Tricks & Techniques; Binary Decision Diagrams. ISBN 0-321-58050-8. ——— (2005). "The Art of Computer Programming". 4, Fascicle 2: Generating All Tuples and Permutations. ISBN 0-201-85393-0. ——— (2005). "The Art of Computer Programming". 4, Fascicle 3: Generating All Combinations and Partitions. ISBN 0-201-85394-9. ——— (2006). "The Art of Computer Programming". 4, Fascicle 4: Generating All Trees—History of Combinatorial Generation. ISBN 0-321-33570-8. ——— (2015). "The Art of Computer Programming". 4, Fascicle 6: Satisfiability. ISBN 0-134-39760-6. ——— (1984). Computers & Typesetting. A, The TeXbook. Reading, MA: Addison-Wesley. ISBN 0-201-13447-0. , x+483pp. ——— (1984). Computers & Typesetting. A, The TeXbook. Reading, MA: Addison-Wesley. ISBN 0-201-13448-9. (softcover). ——— (1986). Computers & Typesetting. B, TeX: The Program. Reading, MA: Addison-Wesley. ISBN 0-201-13437-3. , xviii+600pp. ——— (1986). Computers & Typesetting. C, The METAFONTbook. Reading, MA: Addison-Wesley. ISBN 0-201-13445-4. , xii+361pp. ——— (1986). Computers & Typesetting. C, The METAFONTbook. Reading, MA: Addison-Wesley. ISBN 0-201-13444-6. (softcover). ——— (1986). Computers & Typesetting. D, METAFONT: The Program. Reading, MA: Addison-Wesley. ISBN 0-201-13438-1. , xviii+566pp. ——— (1986). Computers & Typesetting. E, Computer Modern Typefaces. Reading, MA: Addison-Wesley. ISBN 0-201-13446-2. , xvi+588pp. ——— (2000). Computers & Typesetting. A-E Boxed Set. Reading, MA: Addison-Wesley. ISBN 0-201-73416-8. Graham, Ronald L; Knuth, Donald E.; Patashnik, Oren (1994). "Concrete mathematics: A foundation for computer science" (Second ed.). Reading, MA: Addison-Wesley. ISBN 0-201-55802-5. MR 1397498. xiv+657 pp. 1 2 "Donald Knuth: 1998 Fellow". Computer History Museum. 2015. Retrieved March 30, 2015. 1 2 "Professor Donald Knuth ForMemRS". London: Royal Society. Archived from the original on 2015-11-17. 1 2 3 Knuth, Donald Ervin. "Frequently Asked Questions". Home page. Stanford University. Retrieved 2010-11-02. ↑ "Donald E. Knuth". Retrieved October 15, 2016. 1 2 3 Molly Knight Raskin (2013). No Better Time: The Brief, Remarkable Life of Danny Lewin--the Genius who Transformed the Internet. Da Capo Press, Incorporated. pp. 61–62. ISBN 978-0-306-82166-0. ↑ Shasha, Dennis Elliott; Lazere, Cathy A (1998). Out of their minds: the lives and discoveries of 15 great computer scientists. Springer. p. 90. ISBN 978-0-387-98269-4. 1 2 3 Koshy, Thomas (2004). Discrete mathematics with applications. Academic Press. p. 244. ISBN 978-0-12-421180-3. Retrieved July 30, 2011. ↑ History of Beta Nu Chapter. "Theta Chi". CWRU. ↑ "A.M. Turing Award; Donald ("Don") Erwin Knuth". ACM. 1974. ↑ "The Art of Computer Programming". Stanford University. ↑ Knuth, Donald Ervin. "Home page". Stanford University. Retrieved 2005-03-16. ↑ Knuth, Donald Ervin. "Curriculum vitae". Stanford University. ↑ Karp, Richard M. (February 1986). "Combinatorics, Complexity, and Randomness". Communications of the ACM. New York, NY, USA: ACM. 29 (2): 98–109. doi:10.1145/5657.5658. ↑ "BBVA Foundation Frontiers of Knowledge Awards". Retrieved October 15, 2016. ↑ Knuth, Donald Ervin. "The Art of Computer Programming (TAOCP)". Retrieved May 20, 2012. ↑ Weinberger, Matt (26 April 2016). "Bill Gates once said 'definitely send me a résumé' if you finish this fiendishly difficult book". BusinessInsider.com. Retrieved 13 June 2016. "If you think you're a really good programmer... read (Knuth's) Art of Computer Programming... You should definitely send me a résumé if you can read the whole thing," read a quote from Bill Gates on the cover of the third edition of the first volume. 1 2 Knuth, Donald Ervin. "Surreal numbers". Home page. ↑ "Professor Donald Knuth's Thinking Against Software Patents" (PDF). Notices (article). The American Mathematical Society. March 2002. ↑ Knuth, Donald Ervin. "Against software patents" (PDF)Letter to the patent offices in the USA and Europe. ↑ "Professor Donald Knuth". Magdalen College. Retrieved December 6, 2010. ↑ "Notices". Oxford University Gazette. October 30, 2014. Retrieved May 21, 2015. ↑ Reutenauer, Arthur. "A brief history of TeX, volume II". TUGboat: 68–72. ISSN 0896-3207. 1 2 Knuth, Donald Ervin (1980). 计算机程序设计技巧 (Ji suan ji cheng xu she ji ji qiao) [The Art of Computer Programming]. Translated by Guan, JiWen; Su, Yunlin. Beijing: Defense Industry Publishing Co. I fondly hope that many Chinese computer programmers will learn to recognize my Chinese name Gao Dena, which was given to me by Francis Yao just before I visited your country in 1977. I still have very fond memories of that three-week visit, and I have been glad to see Gao Dena on the masthead of the Journal of Computer Science and Technology since 1989. This name makes me feel close to all Chinese people although I cannot speak your language. ↑ "Donald Knuth: 85 – Coping with cancer". Web of Stories. April 2006. Retrieved May 2, 2012. ↑ "Rewriting the Bible in 0s and 1s". Technology Review. Massachusetts Institute of Technology. ↑ Knuth, Donald Ervin. "Frequently Asked Questions". Home page. Stanford University. Retrieved November 2, 2010. ↑ Knuth, Donald Ervin (June 1957). "Potrzebie System of Weights & Measures". Mad Magazine (33). ↑ Knuth, Donald Ervin (2010). "An Earthshaking Announcement" (PDF). TUGboat. 31 (2): 121–24. ISSN 0896-3207. ↑ "Gruppe 1: Matematiske fag" (in Norwegian). Norwegian Academy of Science and Letters. Retrieved October 7, 2010. ↑ Knuth, D. E. (1974). "Computer science and its relation to mathematics". Amer. Math. Monthly. 81: 323–343. doi:10.2307/2318994. ↑ Knuth, D. E. (1992). "Two notes on notation". Amer. Math. Monthly. 99: 403–422. doi:10.2307/2325085. ↑ "American Mathematical Society". Retrieved October 15, 2016. ↑ Knuth, Donald E. (1979). "Mathematical typography". Bull. Amer. Math. Soc. (N.S.). 1 (2): 337–372. doi:10.1090/s0273-0979-1979-14598-1. MR 520078. ↑ "Harvey". IL: Technion. 1995. ↑ Galardonados (2010). "Fronteras" (in Spanish). ES: FBBVA. ↑ Myers, Andrew (June 1, 2001). 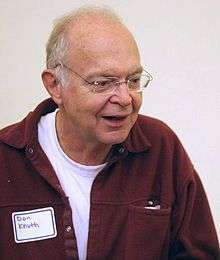 "Stanford's Don Knuth, a pioneering hero of computer programming". Stanford Report. Retrieved June 27, 2011. ↑ Knuth, Donald Ervin. "Books". Home page (list). ↑ Knuth, Donald Ervin. "Literate Programming". Home page. ↑ Knuth, Donald Ervin. "Selected Papers on Computer Science". Home page. ↑ Knuth, Donald Ervin. "Digital Typography". Home page. ↑ Knuth, Donald Ervin. "Selected Papers on Analysis of Algorithms". Home page. ↑ Knuth, Donald Ervin. "Selected Papers on Computer Languages". Home page. ↑ Knuth, Donald Ervin. "Selected Papers on Discrete Mathematics". Home page. ↑ Knuth, Donald Ervin. "Selected Papers on Design of Algorithms". Home page. ↑ Knuth, Donald Ervin. "Selected Papers on Fun and Games". Home page. ↑ Knuth, Donald Ervin. "Companion to the Papers of Donald Knuth"]". Home page. Knuth, Donald Ervin. Home page. Stanford University. Knuth, Donald Ervin. "The Art of Computer Programming (TAOCP)". Retrieved May 20, 2012. Platoni, Kara; Archibald, Timothy (May–June 2006). Love at First Byte. Stanford Magazine. Stanford Alumni. Donald Knuth's home page at Stanford University. "Donald E. Knuth". Charles Babbage Institute, University of Minnesotaoral history interview Knuth discusses software patenting, structured programming, collaboration and his development of TeX. O'Connor, John J.; Robertson, Edmund F., "Donald Knuth", MacTutor History of Mathematics archive, University of St Andrews .